LEN - www.lankaenews.com | ‘Navy Sampath’ brutal murderer of nefarious criminal decade wanted in connection with a series of murders arrested ! (Lanka e News 16.Aug.2018, 6.00PM) A former lieutenant commander of the Navy , Hettiarachi Mudiyansalage Chandana Prasad Hettiarachi alias ‘Navy Sampath’ the prime suspect in the brutal killing of 11 youths (Sinhala , Tamil and Muslims) after committing extortion during the period between 2008 and 2009 (Rajapakse criminal era) was arrested by the CID on 14th, when the criminal was hiding and in disguise. The victims of this ruthless multiple murders were residents of Trincomalee and Colombo. At the time of his arrest at Lotus Road, Colombo he had grown a beard to hide his identity, and was using a fake identity card bearing the name Polwatte Gallage Asoka. He was working as a watcher in Dompe and in hiding. Interestingly , during the last nefarious corrupt cruel decade , the torture chamber for those who were abducted and detained was run in Dompe. During the trial of Navy Sampath’s brutal murders under case No. B/732/2009 , in which he was the prime suspect , when he was summoned by the CID , he was kept in hiding and sent abroad with the assistance of former Navy commander ( now chief of security council) Ravindra Wijegunaratne , it was widely reported. When the suspect was interrogated today , he revealed he was in Malaysia and returned to SL 6 months ago. The police issued a public notice with Navy Sampath’s photograph with a view to capture him . Three warrants along with an international warrant were issued by court to arrest him. In that notice and the warrants it was mentioned Navy Sampath was residing at 54/1 , Wennawatte , Wellampitiya , and that he had fled abroad. 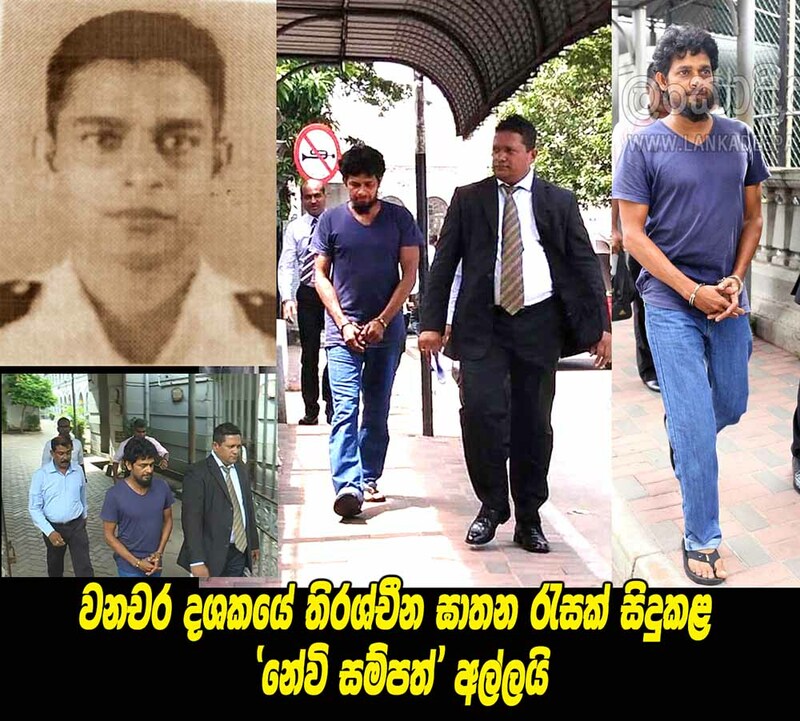 Navy Sampath was arrested in connection with the murder of Nadaraja Raviraj too but was released during the Rajapakse regime. It is to be noted , this brutal ruthless criminal had committed the abductions , extortions and murders during the time when he was the buddy ( close personal friend and security officer ) of ex Navy Commander Karannagoda . Although Karannagoda’s name had been mentioned incriminating him in these brutal murders , no action had been taken nor charges filed against the ex Navy Commander (currently chief of the security council) who gave protection to the murderers and helped to secretly flee the country. Navy Sampath who enjoyed the patronage and protection of the Navy commanders, through Mohomed Ali Anver Hajiar of Kotahena abducted the 11 innocent youths and killed them after committing extortion. Since it was feared that the secret will be out through Ali Hajiar, the latter too was abducted and killed after inflicting torture. Navy Sampath who was arrested was produced before additional magistrate Ms. Kanchana M.Silva this afternoon , who gave permission to the CID to detain him until 15th for questioning.